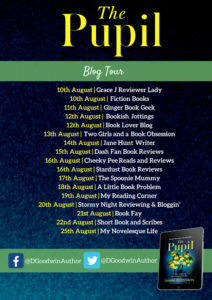 It’s my pleasure to be taking part in the blog tour for The Pupil by Dawn Goodwin today and I have a fab extract to share with you. My thanks for Vicky Joss from Aria for the place on the tour. Psychological suspense from the author of “The Accident” that explores a labyrinth of lies, manipulation and revenge. 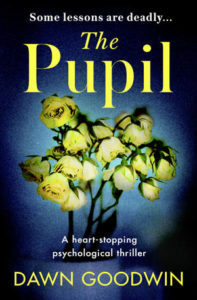 Perfect for fans of Louise Jenson and Katerina Diamond. I tried to put Samuel out of my head for the next few days, telling myself that he was just being polite and friendly in offering to help me. Just like I had been when I said I would call Shelley again. It wasn’t likely to happen. I wasn’t one for fostering friendships, especially in these days of social media when it wasn’t easy to keep past mistakes locked out of sight. Besides, when would I find time to see her – or Samuel? I couldn’t imagine Paul being open to me spending my evenings in town instead of at home where I belonged. Even so, I couldn’t help myself from constantly checking my phone like a teenager for missed calls and voicemails in between loads of washing, dog walks and shopping lists. I’ve been thinking about your book and I’d like to help. Call me, Sam. That put the ball firmly in my court. Oh God, what now? That evening I waited anxiously for the sound of Paul’s key in the door. I wiped down countertops that were already clean and mindlessly paired socks as the kids stared, fixated, at their iPads. Not something I would normally let them do before bedtime, especially when Paul was due home at any moment, but my distracted mind couldn’t handle any noise tonight. I’d been jittery with excitement and anxiety since receiving the message, unable to set my mind to anything other than simple chores. It made me realise just how much I wanted to keep writing. It had been a dream of mine when I was younger, but reality had pushed me onto a different career path and the dream was then put in a box on the highest shelf of my mind. Now I had the opportunity to reopen that box. The kids were at school all day and my time was spent on mundane household tasks and trips to the gym. I had the hours to spare. But I would have to convince my husband that this stay-at-home mum had grander ambitions than domesticity. The minutes ticked past and still no sign of Paul. I finished the sock sorting and cajoled the kids into the bath. More minutes dissolved away as the water splashed over the rim and toothpaste coated the sink. Typical that he would be late tonight when I wanted to speak to him. Eventually, as I was heading down the stairs after sharing bedtime stories and turning out their lights, I heard his footsteps on the gravel driveway outside. He shuffled in on a chilly wind and slammed the door behind him before looking up at me as I descended the rest of the stairs to greet him. ‘Hey, how was your day?’ I said lightly. ‘You’re later than expected.’ I approached him to give him a light kiss and clocked the unusual smell of beer on his breath. He threw his coat over the bannister and fawned over Bo for a minute. ‘I don’t want to disturb them if they’re already in bed.’ Then he retreated to the lounge and turned on the news channel. I warmed the cottage pie and made a green salad, but by now I had almost convinced myself that it was a stupid idea, I’d never be good enough to get published and that I should stick to my domestic responsibilities. Why rock a stable boat? When Paul wandered into the open-plan kitchen and family room for dinner once he had caught up on the day’s news, I was sitting patiently at the table, Bo at my feet and my fingers tapping at a glass of water. He sat down opposite me and immediately reached for the salad bowl. ‘Smells good, thank you,’ he said before piling greenery onto his plate. I went to retrieve the cottage pie from the oven. ‘So how was your day?’ I asked over my shoulder before returning to my seat. I watched the top of his head as he shovelled cottage pie into his mouth, a serviette tucked neatly in his lap, his tie still knotted under his collar. His hair had thinned over the years, his scalp naked and vulnerable under the greying strands. ‘He really likes my book and wants to help me, see if we can get it published.’ I knew I was exaggerating, but I needed Paul to think there was something to it if he was to agree. Paul kept eating and I wasn’t sure if he was actually listening, so I carried on. ‘Are you sure that’s wise?’ His fork finally stilled. And you, right? Don’t do anything that would mean you putting yourself out, of course. 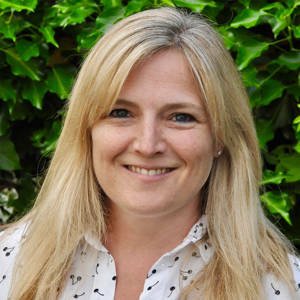 Dawn’s career has spanned PR, advertising and publishing. Now, she loves to write about the personalities hiding behind the masks, whether beautiful or ugly. Married, she lives in London with her two daughters and a British bulldog called Geoffrey.